Valencia has ended the season in 3rd place in the Spanish premier league and is directly going to the Uefa Champions League without having to go through one qualifier. 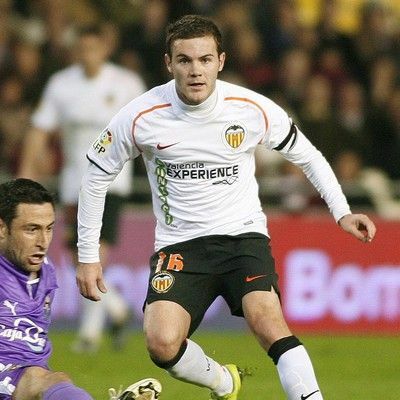 So who was the best summer signing for Valencia CF and who was the best player through this whole season, how do we come to such a conclusion!? Do you look at the official statistics, personal ratings, overall skill, team work all of the above or a mix of some. Well I'll be looking at the official statistics, my own ratings I give to the players and just generally assessing who did better with the amount of playing time he got. 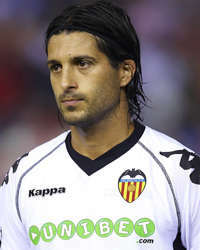 The three runners for the best signing in the 2010/11 season are: Roberto Soldado, Alberto Tino Costa and Mehmet Topal. Roberto Soldado has scored 18 goals and provided 3 assists in La Liga and has been on red hot form for the last 3 months. He works hard, he has good shooting ability and actually has got pace and explosiveness, something I’ve said he didn’t have in the mid-season awards. He has improved so much since then and has been so consistent, fast and explosive this second half of the season. He has also kept his good heading ability, but still lacks the mindset and loses his cool way too much as we have witnessed in several matches. Roberto Soldado has also scored 6 times in the Uefa Champions League helping Valencia progress through the group stages. Tino Costa started slowly only featuring after Ever Banega was injured, but has come off strong since then and has been really one of the main players this season. He has scored 4 goals and provided 1 assist in La Liga and has scored 2 goals in the Champions League. Tino Costa lacks the possession ability where he can spread and dictate the match, but he is good in defending and tracking the ball as well as linking up with the attackers when really offensive. He also has great shooting ability as seen vs Turkish team Bursaspor, but he lacks in other areas such as dribbling, pace and long passing. Mehmet Topal had to wait on David Albelda getting injured to truly come to the forefront and get consistant playing time, but he has taken his opportunity and established himself as a starter and as a good replacement for the aging David Albelda. He has started 21 games in La Liga and scored a goal in the process as well as provide 1 assists. He also has 1 assist in the Champions League, but really it’s the defensive aspects where Topal is the greatest. He has the speed, composure and field awareness to be able to close down opponents and cover them well. He keeps his passing simple and short, but this allows him to have a great passing accuracy and very few lost balls. He was bought to try and compensate for David Villa departure and at 10 million euros it was the biggest purchase of the summer. He was expected to score around 10 goals and than have other striker Aritz Aduriz alleviate some of the burden and together to catch up to Villa's goals, but Soldado has achieved much more. In fact he has scored 18 goals in La Liga and additional 6 more in the Champion League and all this while he had a quite long injury just at the start of the season. The three runners for the best player award are: Roberto Soldado, Juan Mata and Vicente Guaita. Juan Mata has scored 8 goals and provided 12 assists and some of the goals he has scored have been in crucial moments, earning Valencia all 3 points. He started the season slowly and sluggishly as many players participating in the world cup did and it wasn’t until the later stages of the first half of the season he really started stepping up his game. Juan Mata really came into his own after the winter break with some amazing plays and tons of assists in almost every match. He started the season low, but ended it on a high. Juan Mata has also scored 1 goal and provided 3 assists in the Champions League, helping the team go through the group stages. Vicente Guaita has been a revelation this season for Valencia. Originally the third goalkeeper it’s like in the fairytale’s how he came to become Valencia’s first choice goalkeeper when he was the 3rd choice keeper at the start of the campaign. It wasn’t until Cezar Sanchez and Miguel Angel Moya both got injured and for long period of time so the opportunity presented itself and Guaita took it. Vicente Guaita started in 19 games in La Liga and 3 in the Champions league, making 67 saves in La Liga and 17 in the Champions League, some solid saves against Manchester United, putting him on the radar of Sir Alex Ferguson. It was a tough call between Roberto Soldado and Juan Mata, but at the end Mata deserves this more than anyone else. He is still very young, only 23 years old and while he shows amazing play, he still has so much more potential. This season he started slow, but as the season was progressing, so was Mata and he was playing better and better. In fact he singlehandedly saved the team couple of times with some late goals and/or assists. He is creative, has vision, technique and good passing ability and some very accurate crosses. Obviously a long term player for Valencia to build the team around. The three runners for the worst player of the season are: Chori Dominguez, Marius Stankevicious and Angel Dealbert. Chori Dominguez since his move to Valencia CF has failed to live up to his reputation and has fallen really low in the team pecking order. Originally bought to replace David Silva he utterly failed to do so. This season was his biggest chance to shine, but with only 2 good games and the other games all below average as well as constant arguing with the coach he soon became a fringe payer. Undoubtedly a talented player, one of the best at Rubin Kazan but he failed to show off his skills at Valencia and coupled with his off field problems he has turned into a failure. Marius Stankevicious ranks the lowest in my player ranks and this is why he is here. While he is a decent player, great passer, very fast, tall and hardworking he just lacks the positional awareness and tackling ability to be very effective. He has also had lapses in concentration and allowed for some ridiculous goals, which are responsible for lowering his rank so low. While he has had some good games he is just not Valencia quality and deserves this place. Angel Dealbert is only here because of the voting I’ve made earlier about worst player and you voting his as worst player. In my view he is a good defender, not great, but can certainly hold his own and is a good player to have. He is very slow, sloppy on the ball and when under pressure makes mistakes, but if he only defends and instantly gets rid of the ball when at his feet, he is a valuable resource. He has had 2-3 bad matches, but he has had 5-6 good matches as well, in fact Valencia went on a 4-0 no goals conceded streak with him in the defense. The worst Valencia player is: Chori Dominguez. If players like Roberto Soldado and Tino Costa are the success story, Chori Dominguez is the opposite. He can talk the walk, but can't walk the walk. He has failed to help Valencia in any capacity, not with his play, not with his actions outside of the field, not with the constant arguing with the coach. He just doesn't seem capable of doing anything right and is just dividing the dressing room and causing frictions. He should be sold and dealt with and he is rightfully deserving of the title worst player.